Schedule management: a more complex task than it may seem! MEDEXA offers centralized management that enables you to eliminate scheduling conflicts. Our sub-modules make your life easier and increase efficiency on the management level. Administrating multiple teams’ schedules can be a major challenge. MEDEXA solves your problems thanks to a central interface that lets you easily manage your teams and appointments – even for the members of another clinic or location! 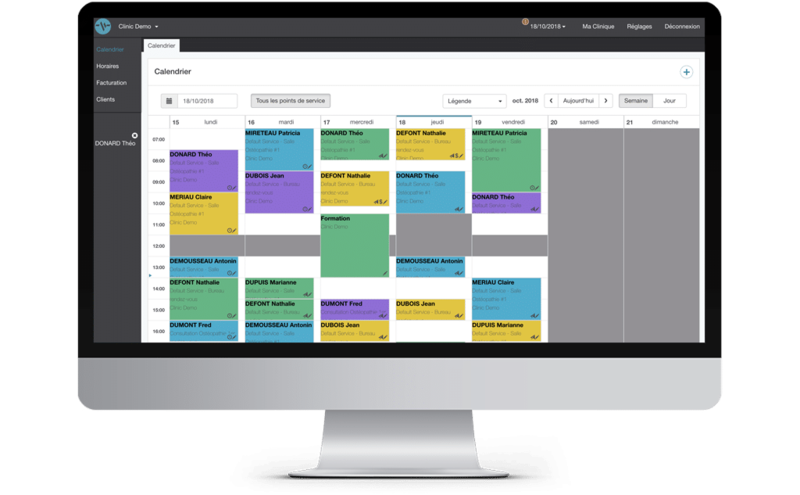 MEDEXA manages the room occupation schedule and even handles your personal appointments. Do you have a class or a dentist appointment? Add it to your schedule on MEDEXA, and you can even send yourself text reminders. Avoid lost earnings due to missed or forgotten appointments. 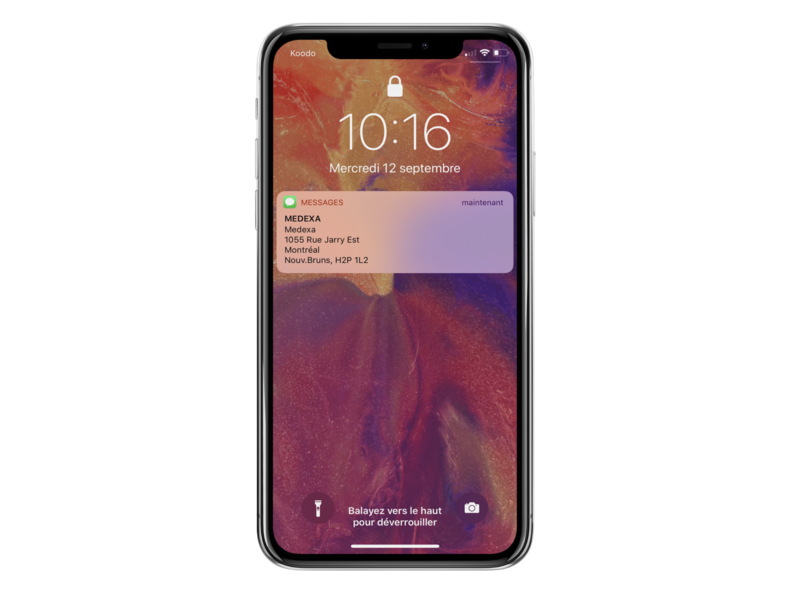 MEDEXA automatically sends a text and/or email reminder to your patients. You can set the reminder date and decrease your clinic’s absenteeism rate fivefold. Connect your website and your Facebook page to your calendar and let your patients book appointments directly online. 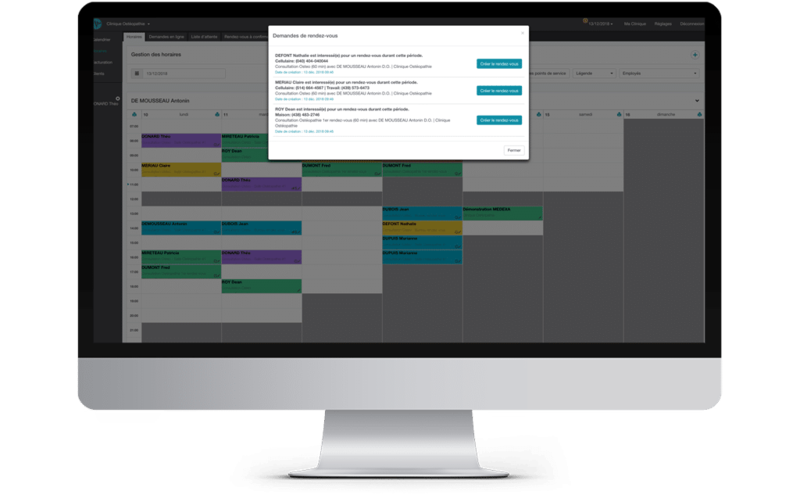 If desired, you can automatically accept appointments or validate them manually to maintain control over your calendar. 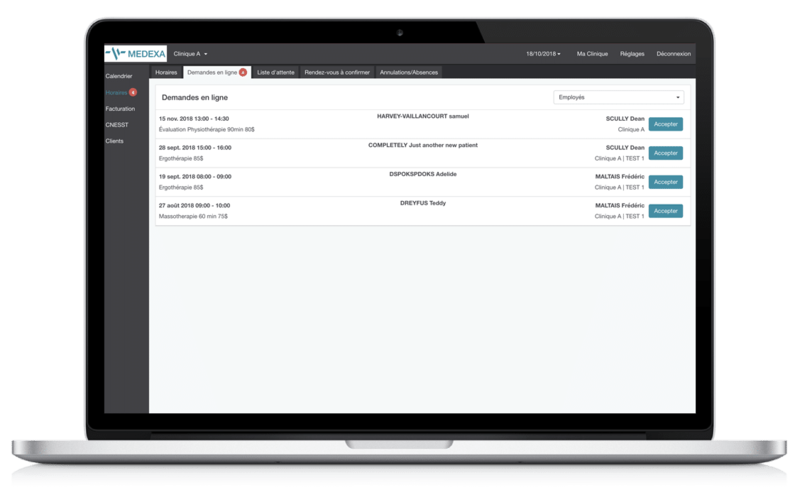 Once the appointment is booked, the online appointment booking interface will automatically create the appointment and the patient file (for new patients) to constantly optimize your time. Add patients to a waiting list with MEDEXA. You can specify the practitioner in question, the availability date, and the type of service requested. If a corresponding time slot becomes available, MEDEXA will alert you with all the necessary information so that you can quickly contact the patient. MEDEXA therefore helps you optimize your calendar and avoid having any holes in your schedule caused by cancellations. MEDEXA offers a multitude of schedule management tools.